I spent so many hours outdoors when I was a kid. There were long summer evenings playing hide and seek with all the other kids on my block, running from one garden to the next and only reluctantly going indoors when our parents’ calls became more and more insistent. There were hours sprawled on the grass, daydreaming. I walked to and from school with my friends and have fond memories of talking to a neighbour who was an avid gardener but was always willing to take a break and chat with us as we walked past. Times have changed. We’ve moved indoors and are seduced by screens. The outside world has become a threatening place. Parents are reluctant to let their children play outside or walk to school or talk to strangers. And peer pressure makes it very difficult for parents to break with this model. Outdoor play isn’t just for fun. It’s also an important tool for learning, socialization, emotional wellbeing, and physical fitness. When the body is active, there’s increased blood flow to the brain, which helps with memory and learning. Being outdoors engages the senses, providing a multi-sensory experience that improves retention by creating more pathways into the brain. But learning and physical activity aren’t inspired by flat expanses – you don’t play hide and seek in an empty field and you’re far more likely to have a picnic with friends on a shady park bench than in a mall parking lot. Add a hill to your playground and you have a powerful magnet for young children to climb up and roll down. Add in a grove of trees, and you have a magic kingdom with mountains and forests. A small English school ground provided an asphalt surface where the children played soccer. It was difficult to use the space for anything else for fear of being hit by a ball. A playground redesign transformed the schoolground. They caged the soccer area, which the kids loved because they didn’t have to chase the ball, and a pond and benches were placed beside it, creating an invitation for all sorts of different activities. 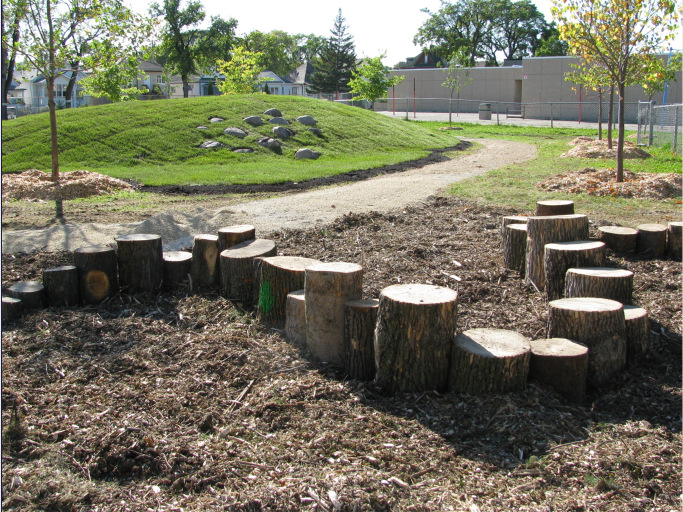 School grounds aren’t the only under-utilized outdoor spaces in our cities. Our city parks have the potential to be social gathering places and wildlife habitats. A Toronto park has a tandoori bake oven, sharing culture through food. Other parks have open sand and water areas where children can play. Parks with community gardens are used more frequently, becoming social gathering places. Parks with barbecue pits host family celebrations as well as teenagers on a Friday night. The theme of this year’s NatureCity Festival is Healthy by Nature. Cam Collyer is one of two speakers at the festival’s keynote event at 7:30 pm, May 25, at the Broadway Theatre. 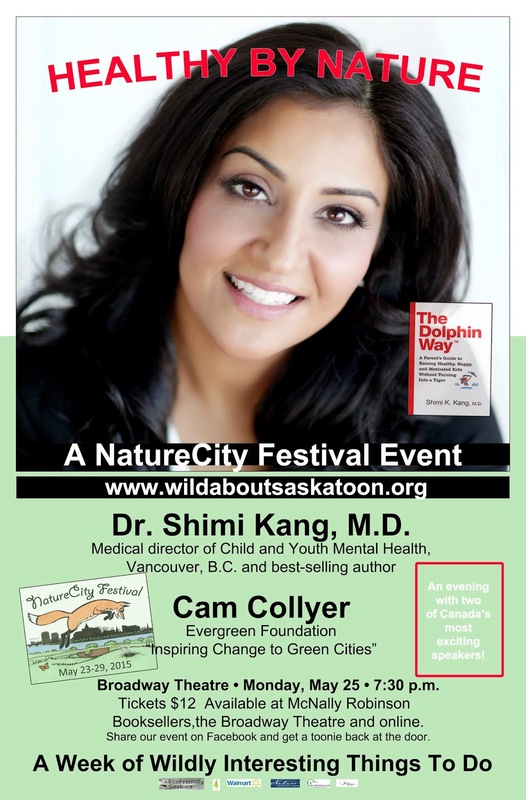 Dr. Shimi Kang, author of The Dolphin Way, will explain why everyday contact with nature is critical to health and wellbeing, while Cam Collyer will provide practical advice on how we can adapt our urban environment to meet our needs. Tickets for the keynote event can be purchased at McNally Robinson Booksellers, Wild Birds Unlimited, the Broadway Theatre box office and website, the Native Plant Society website, and at Wild About Saskatoon under the Keynote tab.